Seldom do I enter an exhibition and wonder how masterly work by a Bay Area artist --- in this case David Gibson, who is in his 60s --- has escaped my notice. Most of Gibson's pastel on paper pictures at Shadravan's Gallery in Oakland depict studio interiors, disheveled but aquiver with potential energy. They display the sort of confidence and relaxed yet relentless scrutiny that typically emerge only after long experience has incubated a native gift. 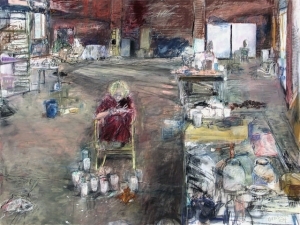 Gibson's "Floating Brushes" (2008) depicts a worktable and its surroundings, cluttered with containers and tools, flanked by a window and another work on an easel. The picture's own sinew of lines and fascia of smeared marks and color suppliment creative equiptment it catalogs. 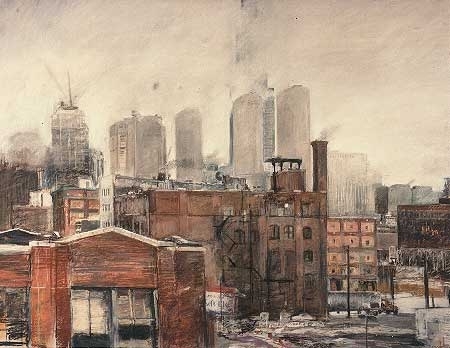 These pastels are documentary in their subject matter and subjective in their approach. To look at a picture by David Gibson is to achieve a cleansing of one’s eyesight.... what makes them refreshing to the viewer is that the familiarity of the scene depicted carries with it such originality of treatment. It is obvious to me that Gibson found his own voice as an artist very early on. The style is representational. What is being represented? Painting itself. Often, the studio is the topic of the painting and the act of painting draws attention to itself... We see and recognize humble objects such as a couple of tables, a chair or two, a small mirror, a staircase perhaps, some papers in a heap. There are also self-referential representations: Gibson often includes a previous painting or two, which I find charming in terms of keeping, as it were, a visual journal of his production. Sometimes, a more loaded account prevails. In the image entitled “A Bird’s Eye View,” half-a-dozen earlier paintings are present..... Gibson’s eye, in scrupulously recording the inventory of his studio, is to be commended for not trying to impose any element in particular upon the viewer. Gibson does not try to brainwash, to impose a vision. He leaves it to viewers to make their own scan, or as it were, visual itinerary through any one of his pictures. A kindred delicacy governs his use of color. The best descriptor is the adjective “subdued,” which jibes with the medium being pastels rather than paints..... I am enthralled by the play between white and other colors. Each Gibson painting strives for the delicacy of welding white with color. I love the nuance of colors which have been washed out until only the merest of hint is left. A general and perhaps preparatory background--a floor for instance--if it shows as an indistinct vaguely colored pale surface, makes sing the daring touches of color elsewhere..... A noteworthy feature of these paintings is that despite a quality of finish that stems from highly professional and proud craftsmanship, each picture preserves the spontaneity of a sketch. David Gibson is careful to leave some isolated strokes of the pastels as signs of the physical act of painting. Correspondingly, as one looks at any picture of his, the eye undergoes a kind of a constant Gestalt switch, oscillating in the mental image between a flat surface covered with pastel rubbings and the intended three-dimensional vision in perspective. .........Surely a charge enters any figurative work, and no less does it do so in Gibson’s work.....The same charge flows from each of Gibson’s paintings. The ‘figure’ is an implicit presence, though more often it’s specific representation will be absent. So is present that sense of ‘invitation’ into a particular, personal world. Perhaps it is all of our worlds in one. Edgar Degas to me spoke to us of the outwardly palpable shape of things, of appearances deftly swept into his artist’s stroke. David Gibson brings us completely inside the spaces which any form must contain. Necessarily, implicitly, insistently. As are the strokes with which he brings us to the surface. The studio interiors are brilliant, solid, and signature Gibson painting! [I] especially like the formal Greenbergian geometric qualities combined with the idiosyncratic blood gestures! No fooling! Seriously, great work. 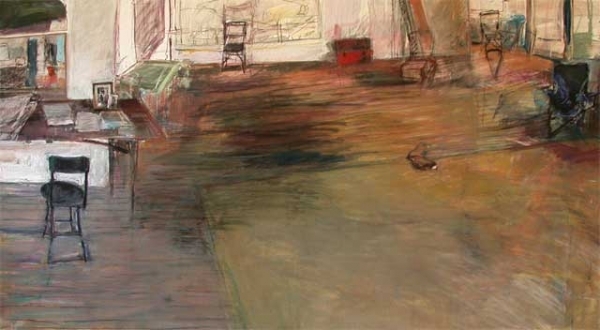 ...Beyond the mere study of form and space, the result of careful and intense observation, and reminiscent of certain paintings of Giacometti, David Gibson's pastels capture something more than the materiality of these spaces. Perhaps it is because he knows them so well that he is able to call on his experiences in them to depict them in a completely different way. The placement of pastel pigment fills these places with a multitude of shades, overflowing the breaks in the floor and the imperfections in the walls. Additionally, the rigidity of space is overcome by the vigorous movement of lines, and by a clever sleight of hand that the painter employs to the point that the onlooker feels himself to be an integral part of the painting. The use of many viewpoints and of paintings within paintings means that our gaze, dispite seeming to be trapped, always escapes toward other places, or even to the refection of the place represented. Mr. Gibson is a perfectly wonderful draftsman. He thinks in terms of line. He does roof-tops, he does landscapes, he does cityscapes. He does old buildings and wall-sides, and he does the various things on the roofs, the diagonals of the fire-escapes and the like. Yes, you've seen all of these things, and you've seen a lot of them. But he celebrates this incredible sense of line-----over and over again. His are standard drawings; they are wonderful drawings, but Mr. Gibson imbues them with something else because he is positively crazy about the synonymous functions of line and light. One of the most beautifully honest things I have read in a statement from an artist is here (in a personal statement by Mr. Gibson that accompanied his show): "At the beginning, these (drawings) began from a desire for another easily accessible landscape..." (in other words, the subjects were there, and he took them, which is nice) "...and they developed into an examination of the subject: the beauty of changing color and light in this crumbling urban landscape...The more I pursued it, the more I became obsessed with the constantly changing skies, the majestic decaying buildings, the water towers, the chimneys, the derelict structures looming in the dense fog and under intense winter skies. So I approached this subject matter with mixed feelings (to put it mildly), and grew to love it." The result of this persistence, thought, and effort are these pieces. And what a wonderful, honest thing to say for a change! What he says in his statement is that he picked the subject matter for his work arbitrarily. It was there. And he gradually found out that it could have meaning and could be an extension of him. David Gibson has accepted his facility and is not torturing that facility as many really gifted, facile people do. He is not hiding it, and he is not overlarding or overlaying it with intellectual conceits and contrivances to keep all of us saying, "Gee, he's a wonderful draftsman, but his work is about nothing." And it is very often the truth that technical skill amounts to nothing, because skill is not equivalent to art at all. Skill has to be transformed by a vision that is distinct from that skill and that sometimes renders skill unnecessary and sometimes amplifies it,or sometimes makes it for skill even to exist. Skill plays a smaller part in art than most people think. Mr. Gibson has accepted his facility and by accepting it without devices and without torturing it, he has used it as a means of inquiring, of searching for a possible subject, and the pursuit of that subject gives his work meaning. You notice how gloriously he says in his own statement what I have been trying to say. He takes his art out of his will and out of his intent. Thank God he's honest enough to do that! He gives his skill the lie by transcending it and allowing it to be a vehicle to pursue the life of the subject that at first he did not identify or recognize. That's a big and a wonderful concession, and it's to be seen in his work! Most other drawings of tis sort, with their handling of light and their talk about color, are hogwash, but in Gibson's hand they are not. His work is honest and it's true, and it will go elsewhere.